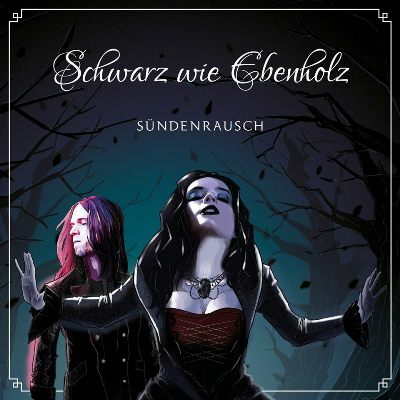 “Schwarz wie Ebenholz” (black as ebony) – this is the new EP by SÜNDENRAUSCH, which was released on June 1st 2016. Thanks to a crowdfunding campaign, it was possible for the duo from North Germany to record at the Chameleon Studios in Hamburg and to have their EP produced by Lord Of The Lost-singer Chris Harms. With the words “Es war einmal vor langer Zeit…” (Once upon a time ….) singer Kira Sinister starts leading us into the title track “Schwarz wie Ebenholz” through a veil of a dim melody into her mysterious, dusky fairy tale world. The hard sounds of the guitar and the drums clarify directly: in here you’re searching for princesses with pink dresses and rainbow swans in vain; rather scheming Red Riding Hoods, gloomy Snow Whites and melancholic Snow Queens are reigning. The next song “Cinderella” opens with a strong, groovy riff. The restlessness of Cinderella, who only can be free in her dreams, is musically well taken up in the verses by the catchy riff that accompanies the constantly harried situation of Cinderella and the central concept of the clock brilliantly. Choirs come in when the chorus begins, Kira conducts with her bell-like voice and invites for dancing. Next, the fairy tale leads through a wall of hard-edge guitars into a dark forest, where we meet the Big Bad Wolf (“Böser Wolf”) in his human form. While Kira sings from the perspective of the wolf in the verses with slightly distorted voice, the chorus socio-critically faces up to the analogies of humans and the deceitful, big bad wolf with all its evil qualities. As a contrast, we’re suddenly standing on a snowy, sunlit glade – it is “Winter”. In the beginning, this song is very contemplative, dreamy poppy and therefore, initially you’re getting lost in the crystal-clear voice and gentle synthie sounds. But the song is increasingly taking up speed and becomes a ballad, the chorus is very powerful and combined, it generates a comfortable atmosphere of dark romanticism. Last stop: Wonderland (“Wunderland”). SÜNDENRAUSCH give their everything with hard-hitting riffs that remind me of Rammstein, a great solo and a catchy tune that will not go away soon: “Ich steh hier allein, aber ich steh!” (I’m standing here alone, but I stand) – No, SÜNDENRAUSCH, with this magnificent EP you’re definitely not standing alone! What do you think about SÜNDENRAUSCH? Would you support their next crowdfunding campaign? Tell us in the comments!